At 1250 on January 6, 1945, Lieutenant Junior Grade Masao Nagatomi took off from Mabalacat Air Base in the Philippines as pilot in a Zero fighter carrying a 250-kg bomb. 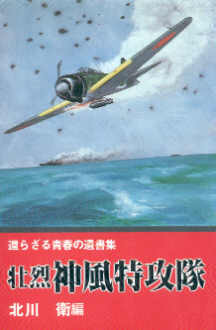 He was a member of the Kamikaze Special Attack Corps 19th Kongō Squadron. He died in a special (suicide) attack at the age of 24. He was from Ōita Prefecture, attended Kwansai Gijuku University, and was a member of the 13th Class of the Navy's Flight Reserve Students. With blessings of heaven and earth and with kindnesses from you, my teachers, and my friends, I truly had 24 happy years. Among the things to appreciate, being able to fall truly makes me happy. My feeling is only to die in an honorable way for the country. While looking at flying fireflies even though it is the new year, I will take off smiling. I believe that others will follow after me. A firefly will fly though the skies of the southern seas this new year. My life is entrusted to my aircraft that will color the skies. I will show my determination while smiling. Father and Mother, please come to Yasukuni . Please smile. I will be waiting with a smile. The letter comes from Kitagawa (1983, 71). The biographical information in the first paragraph comes from Kitagawa (1983, 71) and Osuo (2005, 170).